It may have seemed like a good idea at the time when the designers at Fleer decided to produce the 1991 football set with the images of NFL players popped out of the photo and placed on top of a colorful background. They probably were envisioning spectacular images of quarterbacks and running backs forever remembered on the colorful cards. However it seems they never considered having to use the same design to spotlight an offensive lineman the was being double teamed by his opponent. 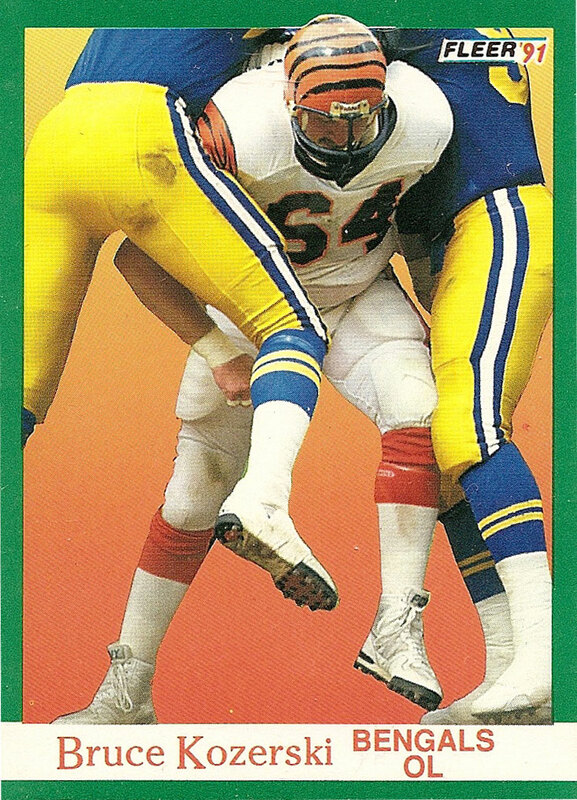 The image of Cincinnati Bengals offensive lineman Bruce Kozerski double team by a pair of defenders from the Los Angeles Rams has to qualify as one of the most hideous sports cards of all time. Kozerski is shown muscling his way past the two defenders who are pictured only from the waist down. The image showcases the two Rams defenders practically draped over the shoulders of Kozerski as he pushes forward downfield. Such a bad design is not fitting for a player who earned the nickname “Mr. Versatile” because he played every position on the offensive line for the Bengals during his career. In 1988 he won the starting center job and helped set the pace for an offense that led the NFL in rushing during the 1988 and 1989 seasons. 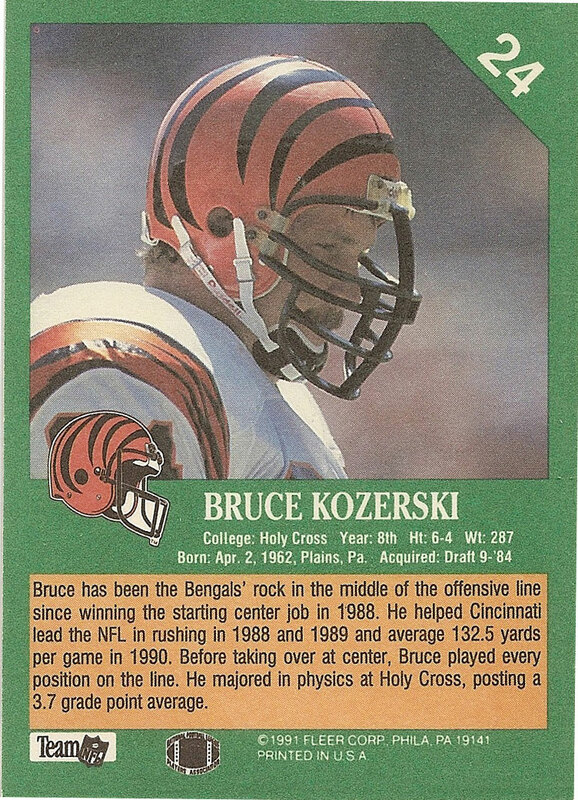 Kozerski, who played his college ball at Holy Cross, was picked in the ninth round of the 1984 draft by Cincinnati. He was named an alternate to the 1988, 1989 and 1990 AFC Pro Bowl squads. He retired following the 1995 season and is currently the head football coach and a teacher at Holy Cross High School in Covington, Ky. Awesome post. That card, and specifically it’s design, it truly heinous. I just blogged about this card I found in my stash, and thought you would like it. OH say it’s so……he was dubbed Mr Versatile, they should have re-shot his card…..one of the best guys anyone could ever meet! Maybe not on the grid iron……He gives back to kids the community and faith. Luv ya Mr VERSATILE! I grew up with this man .He is the best person I could think of to this date.